In most states, open enrollment for the insurance marketplace began on November 1st and will end on December 15th. Instead of sticking with a subpar, overly expensive insurance plan, considering switching to MPowering Benefits for your health care coverage. MPowering Benefits offers a partially self-directed healthcare plan that enables you to set up an HSA with a healthshare plan. Healthshare programs are not offered by insurance companies, but rather by recognized medical cost sharing organizations.. With one million members (as of 2018), many Americans are experiencing savings up to half of what they paid for traditional insurance. 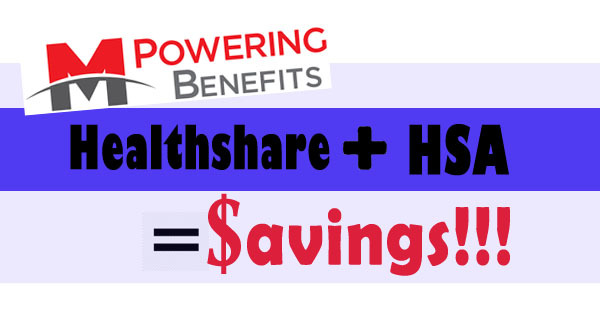 Healthshare programs do not have “premiums”, but rather “contribution amounts”. Typically, these amounts are half or less the cost of an unsubsidized health insurance policy. A health savings account (HSA) is a medical saving account available to consumers with high-deductible plans. Money contributed is not subject to the federal income tax. Using these savings accounts, members are able to save money for medical expenses that are not covered. Just like an individual retirement account (IRA), the money in your HSA grows tax-deferred if not used for qualifying medical expenses. Monthly contribution (like a premium) can be as low as $190 a month depending on several factors, including age, number of people in the household, and plan. For most, that’s a significant difference from what they’re currently paying for traditional insurance. As a cherry on the top, health share plans aren’t locked into specific networks, offering more autonomy and choices. Making the switching could be the best decision for you and your family. Contact one of our Personal Benefits Managers to further discuss your options! You’ll be glad you did. I didn’t think healthshare programs were eligible for HSAs. I was under the impression a HSA could only be paired w/ a HDHP. This is compounded by the fact the healthshare programs are not “insurance” and even their premiums are therefore not tax deductible. Yes, you are correct that you do need an HDHP to qualify for an HSA. This plan has an HSA-qualified MEC health insurance plan, combined with a health care sharing plan to cover larger bills. The MEC (minimum essential coverage) is a group plan on the association that covers preventive care only. It is considered to be an HDHP, because it does have an HSA-qualifying high deductible component.